Timing of snowmelt: why is it important and what do we know about it? Timing of snowmelt runoff affects river ecology, trout behavior, fishing experience, and mid-summer streamflow in natural and regulated river reaches. Runoff timing is most strongly influenced by April-June temperatures (warmer = earlier runoff) and April 1 snow-water-equivalent (SWE; more snow = later runoff). 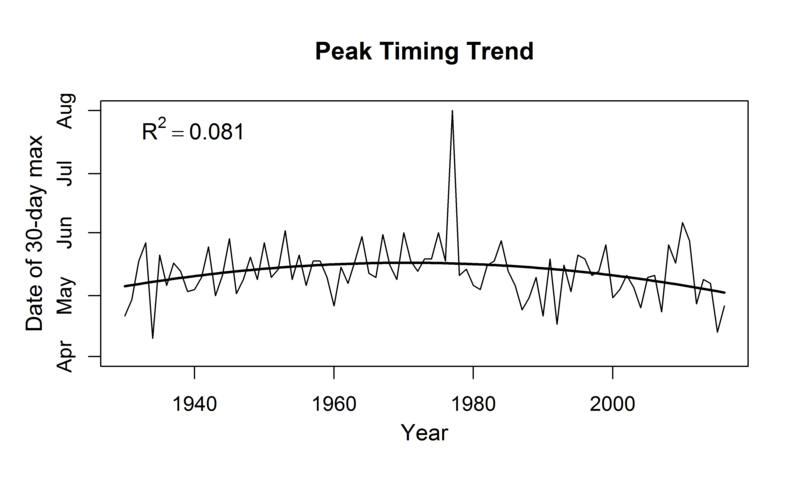 Since 1930, runoff timing in the upper Henry’s Fork has displayed a parabolic (upside-down “U”) trend over time, with the latest runoff occurring in the 1970s. Date of 30-day peak streamflow in the upper Henry’s Fork in 2015 and 2016 ranked 2nd and 9th earliest, respectively, in the last 87 years. Earliest runoff on record occurred in 1934. Over the past 30 years, mean April-June temperature at the watershed’s snow survey sites has warmed at 1.29°F per decade. All other factors being equal, this moves the 30-day peak flow window 5.4 days earlier each decade. Global climate models and data predict continued warming over the next few decades, so we can expect continued earlier runoff. Runoff timing is poorly predicted by conditions in the month of March, so it is too early to make precise predictions of runoff timing in 2017. However, rapid loss of low- and mid-elevation snow since March 10 is greatly reducing the amount of snow on the ground. Thus, we are sure that runoff will be earlier than I would have predicted two weeks ago. Streamflow conditions will most likely be better than last year but not nearly as good as they could have been had the robust early-March snowpack stuck around until the beginning of April. Quick update on current SWE conditions in the watershed. Methods of quantifying runoff timing. Climatic variables that determine runoff timing. Trends in runoff timing and climate. Runoff timing in recent years. Looking beyond 2017—what will the future hold? HFF Research Associate Bryce Oldemeyer compiled most of the climatic data and did some of the statistical analysis that contributed to this blog. 1. Snowpack has been melting rapidly for 10 days. Twelve days ago, I reported that SWE in the upper Henry’s Fork subwatershed had reached 120% of its 30-year median. Unfortunately, SWE peaked two days later and has been declining ever since, due to warm temperatures. Yesterday’s precipitation didn’t help much because the snow level was around 8000 feet. The Island Park site has lost 2.1 inches of water-equivalent since March 10, dropping from 108% of median to its current value of 87% of median. Today’s SWE graph shows how snowpack across the watershed has dropped relative to average. 2. Why is runoff timing important? The timing of runoff in river systems dominated by snowmelt is important to ecological processes, river recreation, and water management. Runoff timing, in conjunction with temperature, determines spawn timing of spring-spawning fish such as Rainbow trout and Cutthroat trout, emergence timing of aquatic insects such as giant salmonflies, and reproduction of riparian shrubs and trees such as cottonwoods. Timing, duration, and magnitude of peak flows also drive erosional and depositional processes that create and maintain trout habitat in mobile stream channels and floodplains such as those of the lower Henry’s Fork, lower Teton River, and South Fork Snake. The quality of fishing and boating is intimately tied to streamflow, and anglers and boaters seek particular flow conditions (sometimes high, sometimes low) for specific types of fishing and floating experiences. Runoff timing is also critical for water management, especially in the upper Snake River basin, where the primary use of water is for irrigation. Early runoff is especially problematic, as it produces high streamflows prior to the time when crops need the most irrigation. When peak irrigation demand occurs later than the natural water supply, water must be release from storage reservoirs to make up the difference, resulting in higher-than-average flows immediately downstream of reservoirs such as Island Park and lower-than-average flows downstream of the major diversion points. Thus, understanding and predicting runoff timing is critical to both anglers and water managers. 3. How do we measure runoff timing? In the Henry’s Fork watershed, we consider the runoff period to last from April 1 to July 31. That rather wide period is necessary because the three major tributaries in the watershed—upper Henry’s (upstream of Ashton), Fall River, and Teton River—vary greatly in watershed elevation and runoff timing. The map below shows the three gage locations where we measure each of these three tributaries. We need the long window to capture the respective peaks of all three tributaries. Date of peak flow. The peak flow is usually defined as the peak over a number of days, for example the peak 7-day flow. We use the peak 30-day flow to smooth out narrow peaks caused by short-term weather events. The larger time window produces much better statistical results and is thus more predictable than shorter-period peaks. We report the date in the center of the 30-day window over which streamflow is greatest. Center of mass. For those of you who have taken probability theory, if the distribution of April-July streamflow is considered as a probability density function (total volume of runoff over that time period sums to 1), then the center of mass is the mean or first moment of that distribution. Thus, you can think of the center of mass as the “mean” date of streamflow between April 1 and July 31. Mathematically, it is calculated by multiplying the day of the year by streamflow on that day, adding those products over the April 1 to July 31 time period and then dividing that sum by the total volume of streamflow that flows down the river between April 1 and July 31. Date on which a given percent of total April 1- July 31 streamflow volume is achieved. For example, if the total April 1 –July 31 streamflow volume is 100,000 acre-feet and 25,000 acre-feet has flowed past the stream gage on May 1, then we would say that the “Date of 25% volume” was May 1. That means that the other 75% of the volume will flow down the river between May 1 and July 31. Date of 50% volume is frequently used, but we found that the date of 25% volume is better predicted in the Henry’s Fork watershed and it aligns well with typical reservoir fill dates and the onset of the three-month period with highest irrigation demand. 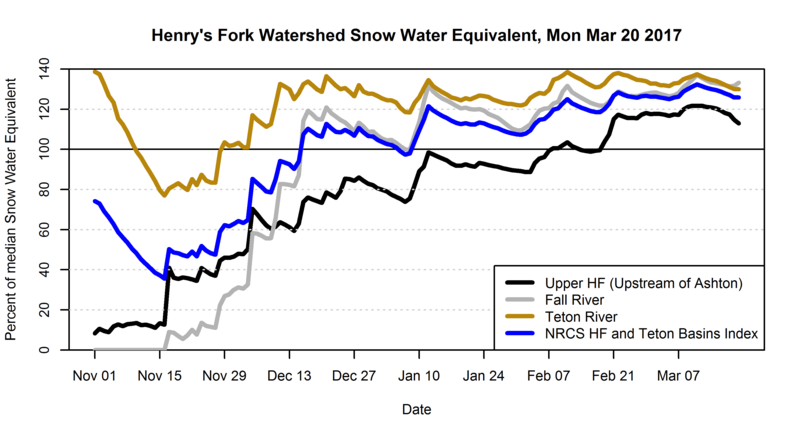 These three measures are indicated on the following hydrograph, which shows natural streamflow in the Henry’s Fork at Ashton during 2014. In this example, the center of 30-day peak flow happened to coincide with the one-day peak, but that actually doesn’t happen very often. This graphic also illustrates another way to think of the center of mass. If the area underneath the streamflow curve was a thin ceramic plate, the center of mass would be the balance point of the plate. Because streamflow is higher in April and early May than over the rest of the time period shown here, the center of mass is to the left of the midpoint of this time period, which is June 1. If streamflow were exactly the same every day between April 1 and July 31, then the center of mass would be June 1. The date of 30-day peak flow is most relevant of these three metrics from ecological and recreational standpoints, whereas the date of 25% (or some other specific percent) volume is more relevant for water management. The center of mass is somewhat useful for water management but is mostly convenient because of its mathematical properties. The timing metric most precisely predicted by the climate variables varied across the streams because of differences in hydrology (e.g., more groundwater influence in the upper Henry’s Fork). Averaged over the three subwatersheds, the date of 30-day peak flow turned out to be the most precisely predicted. In addition, because it is intuitive and most relevant to anglers, I emphasize this metric. 4. What data do we have in the Henry’s Fork watershed? Monthly precipitation, temperature, and SWE at eight SnoTel sites from 1989 to 2016 (Crab Creek, Island Park, White Elephant, Black Bear, Lewis Lake Divide, Grassy Lake, Phillips Bench, Pine Creek Pass). 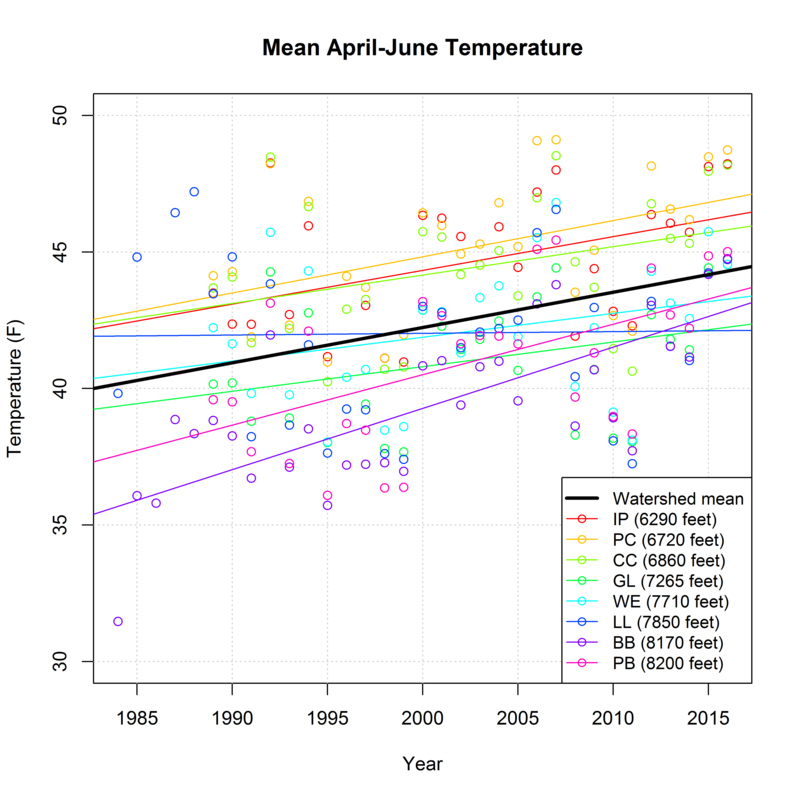 Data at a few sites goes back farther, but the analysis of runoff timing as a function of temperature and SWE is limited to the mid-1980s to 2016. See my SWE methods document for a description of the sites. These data are available from the Natural Resources Conservation Service SnoTel web site. 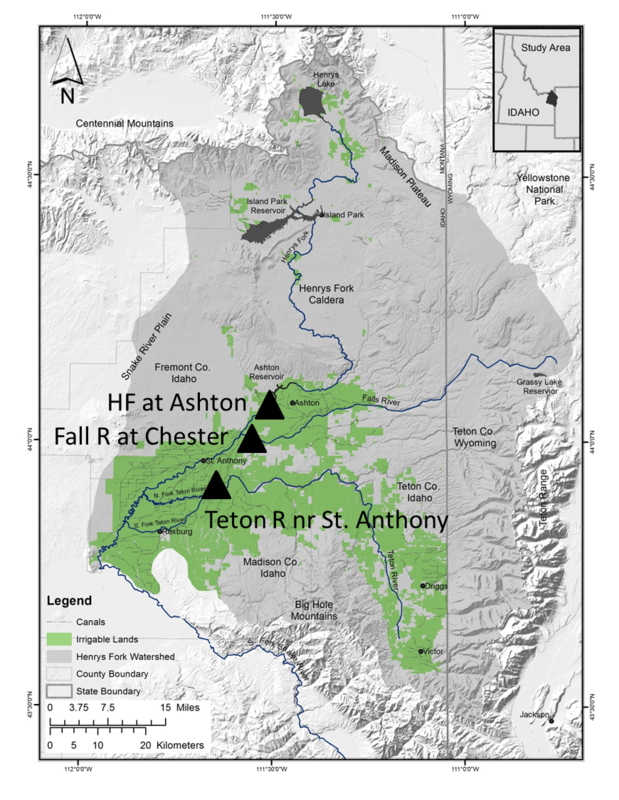 Natural streamflow in Henry’s Fork at Ashton, Fall River at Chester, and Teton River near St. Anthony is calculated by accounting for the effects of major storage reservoirs and diversions upstream. I described this process in last week’s blog. Raw data for these calculations come from U.S. Geological Survey national water information system, U.S. Bureau of Reclamation hydromet, Idaho Department of Water Resources water-rights accounting database, and ET Idaho (database of climate and evapotranspiration data for the whole state). Periods of record are 1972-2016 for HF at Ashton and Fall River and 1978-2016 for Teton River. We have one long record that dates back into the 1930s. We are able to calculate natural streamflow in the Henry’s Fork between Henry’s Lake and Ashton back to water year 1930. Precipitation, temperature, and SWE data are available at the Island Park site back to 1937, although the record has a few gaps in it. This is the longest record we have in the watershed that can be used to analyze relationships among streamflow and climate variables. 5. What climate variables determine runoff timing? The two primary climate variables that determine runoff timing are spring-time temperature and April 1 SWE. Over the watershed as a whole, mean April-June temperature turned out to be the strongest predictor, while mean April temperature was the strongest predictor over the long period of in the upper Henry’s Fork. Temperature was a strong predictor of all three timing metrics we used, whereas April 1 SWE was a strong predictor of center of mass and date of 25% volume but not of the 30-day peak flow. We again used linear regression and information-theoretic model selection to analyze dependence of runoff timing on various climate predictors (explained in my last blog). The statistical methods used here are a little more complicated than the ones used to predict runoff volume. In particular, we account for differences in timing across the three subwatersheds and correlations between years. This last one is important because most climate variables tend vary in cycles—warm years are more likely to follow other warm years, for example. The regression coefficients, standard errors, and model-fit statistics are shown in the table below. Remember from algebra class that a slope is “rise over run”—in this case the change in date of runoff timing per unit change in the predictor variable. As explained last week, the R2 statistic gives the fraction of variability in the response (runoff timing) explained by the predictors (including the year-to-year correlation, which is not listed here). Overall, these are not bad models, and you can see that watershed-wide, the 30-day peak flow is best predicted. On a stream-by-stream basis, runoff timing in Fall River was much better predicted than that of the other two watersheds—the best model for Fall River had R2 = 0.85. This is because Fall River is a long, narrow drainage whose headwaters are very uniform in geology and elevation. When the snow melts in the Fall River headwaters, it all melts at once, producing a narrow, well-defined runoff peak. The other two subwatersheds vary substantially in elevation and geology, so runoff timing is not as well defined. Center of mass and date of 25% volume both get later as April 1 SWE gets higher, since at any given temperature, a larger snowpack requires more time to melt. The negative sign on the temperature slopes indicates that runoff timing is earlier for higher temperature values, which is not a surprise. 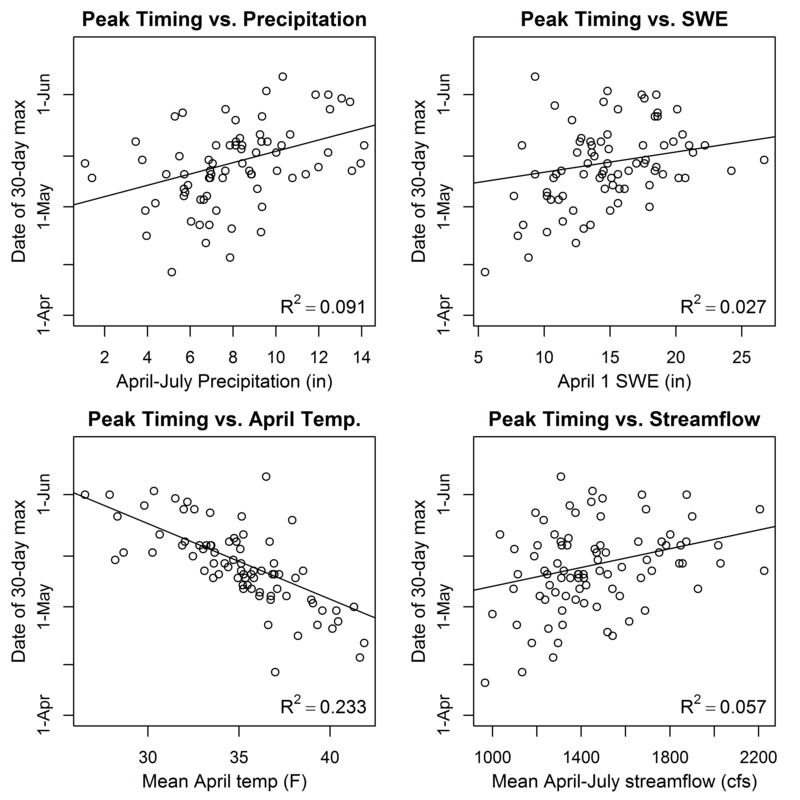 Timing of 30-day peak flow did not depend on SWE, indicating that this measure of runoff timing is simply a function of temperature, regardless of how streamflow is distributed across the spring and early summer. When it is warmer earlier in the summer, streamflow peaks earlier! 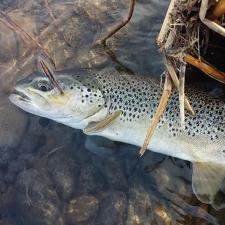 Since other ecological processes such as fish spawn timing and insect emergence are tied to temperature as well as streamflow, the large dependence of 30-day peak flow on temperature is important to anglers. The 30-day peak flow is 4.2 days earlier for each degree increase in temperature. Expect earlier hatches and earlier runoff when it is warmer in the spring. 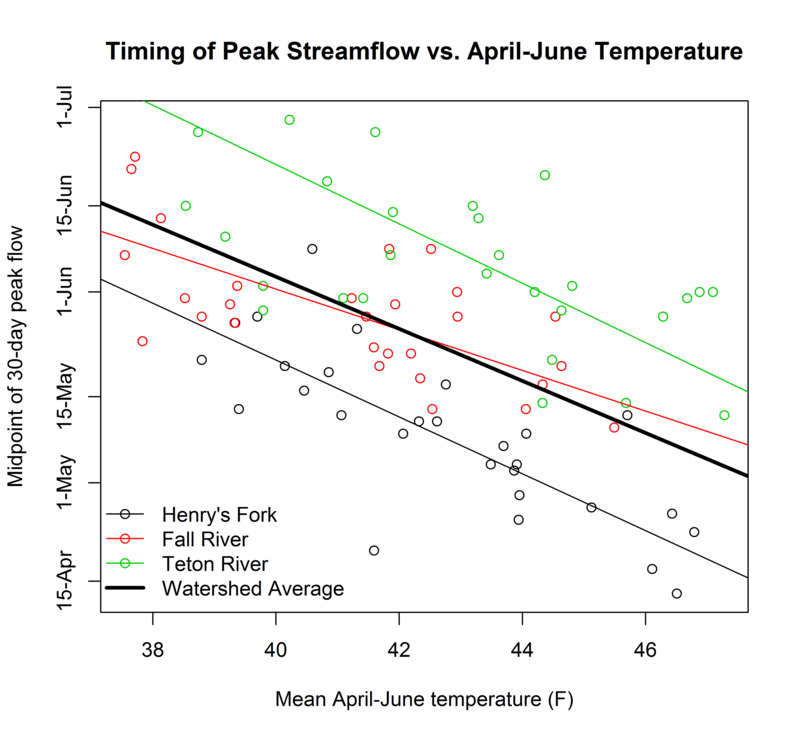 The dependence of 30-day peak flow timing on April-June temperature is shown in the following graph. Regression lines for each of the three subwatersheds are shown by the thin lines; the watershed average is given by the thick black line. It’s easy to see from this graph that the upper Henry’s Fork peaks 7-14 days earlier than Fall River, which peaks 7-14 days earlier than the Teton River. The upper Henry’s Fork record that dates back to the 1930s gave us a large enough sample size to explore dependence of other variables such as spring and summer precipitation and streamflow magnitude itself. These relationships are shown in the graphic below. 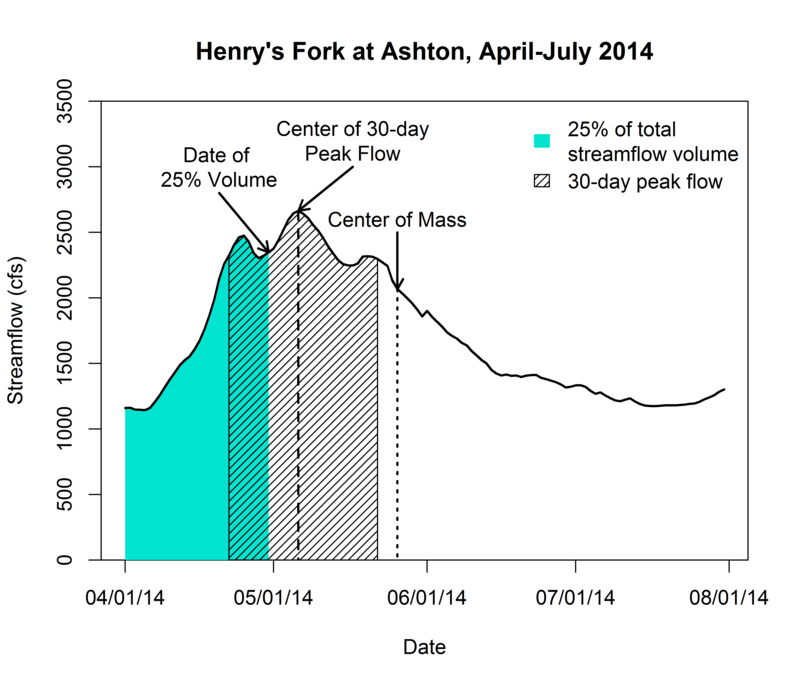 In each case, the vertical axis is timing of the 30-day peak flow in the Henry’s Fork between Henry’s Lake and Ashton. These relationships were all intuitive: runoff timing is later when spring/summer precipitation is higher, April 1 SWE is greater, April temperature is cooler, and streamflow is higher. However, the relationships were weak; only the precipitation and temperature relationships were statistically significant. 6. 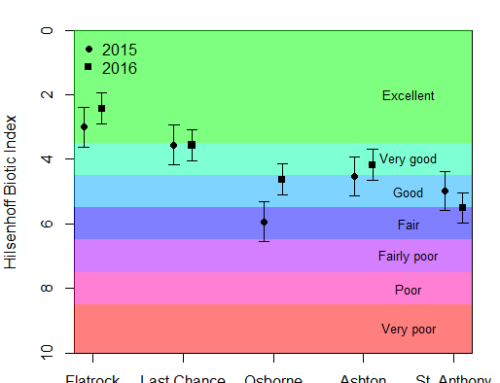 Are there any trends in runoff timing and its predictors? Almost every measure of late-winter and early spring temperature has been systematically increasing over the past 30 years. Minimum and mean temperatures in February, March, April, May, and June showed statistically significant increases of 1 to 2 degrees Fahrenheit per decade. The exception was mean May temperature, which had the lowest rate of increase and was only marginally significant. Since mean April-June temperature was the most important predictor of watershed-wide runoff timing, we show its trend in the graph below. The eight SnoTel sites are color-coded; abbreviations are self-explanatory if you consult the SWE guide. The watershed-averaged trend in this graph is 1.3°F per decade. The model above showed that 30-day peak flow is 4.2 days earlier with each degree of temperature increase, so all other factors being equal, a 1.3°F per decade increase moves 30-day peak flow timing 5.4 days earlier per decade. That’s over two weeks since the mid-1980s. Fish spawn timing, hatches, and cottonwood reproduction will all respond at similar rates. For example, in our study of salmonflies in the Henry’s Fork watershed, we found that date of peak salmonfly emergence is 3.2 days earlier for each one-degree F increase in April water temperature. The 87-year dataset for the upper Henry’s Fork paints a somewhat different picture. The first graphic below shows very little trend in the date of 30-day peak flow. In fact, the best statistical model is an upside-down parabola with peak in the 1970s. In other words runoff timing was slightly higher, on average, in the 1970s than either before or since. This graph does show the downward trend we would expect based on our analysis of more abundant data available since the mid-1980s, but overall, runoff timing has not been getting earlier continuously for the past 87 years. The extremely late peak in the center of the graph is 1977, which was a very dry year with little snow, early runoff and low streamflow. However, a large rainstorm in early August produced that year’s peak flow, which was centered around the last day of July! The graphic below shows long-term patterns in the climate variables. All of them show the same parabolic pattern. The 1970s were, on average, wetter and cooler than earlier and subsequent decades. 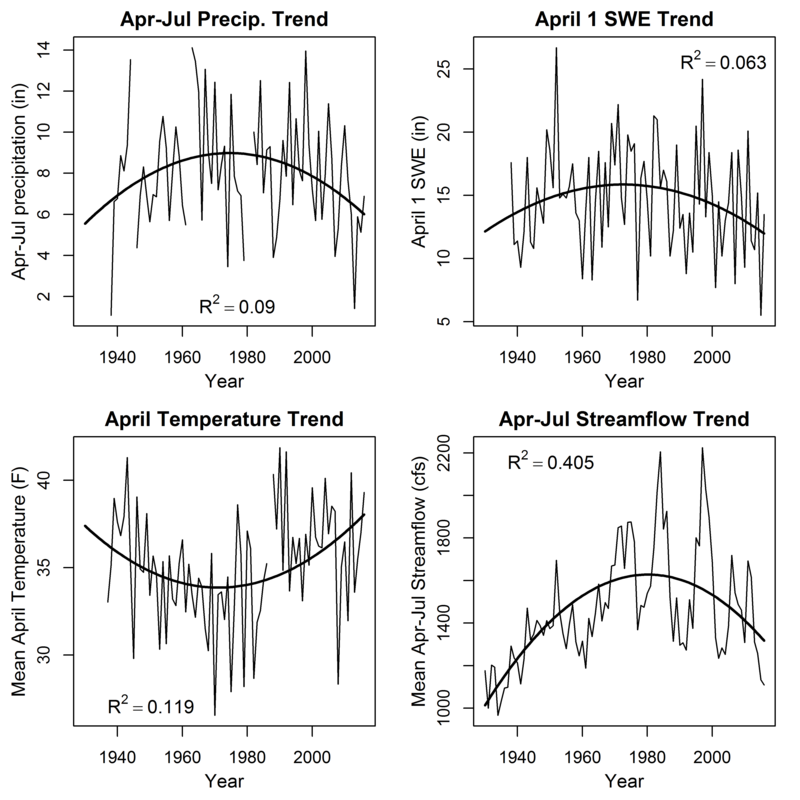 April temperature and April-July streamflow show the strongest of these parabolic patterns. The trend in the April temperature graph over the last 30 years is similar to that shown in the figure above. Note that the decreasing trend in April-July streamflow over the past 40 years has been driven primarily by several sequences of very low water years in the late 1970s, late 1980s/early 1990s, early 2000s, and 2014-2016. That graph also shows that streamflow has been much more variable over the past 40 years than it was in the 1930s through the 1960s. 7. How do recent years compare with averages? Runoff timing in 2015 and 2016 was among the earliest on record. The table below gives statistics for the top-10 earliest runoff years in the upper Henry’s Fork watershed. This is an 87-year record, and 2015 and 2016 are both in the top 10. Note that two of the years in the 1930s are also in the top 10. The same patterns shown in the scatterplots above are apparent here; years with early runoff were warmer than average, with below-average snowpack. These years generally had below-average April-July streamflow and below-average April-July precipitation. In this table, “NA” indicates that data are missing for that particular year. You can download a spreadsheet here that contains the entire 87-year record of these statistics. The following table focuses in on notable years in the recent past. Watershed-averaged runoff in 2015 and 2016 was earlier than average by all measures Compare those two years with 2014, when runoff timing, temperature, and SWE were all very close to average. The last big water year we had was 2011, which had late runoff as a result of high snowpack and cool temperatures. It is not a coincidence that the more than 600 anglers we interviewed in Harriman State Park in 2014 overwhelmingly rated the fishing experience that summer above average. In 2016, anglers overwhelmingly rated the fishing experience in Harriman State Park well below average, with high flows out of Island Park Dam cited as the number one reason for poor fishing. Early runoff in each of the Henry’s Fork subwatersheds in 2016 is shown in the graph below. These graphs show temporal distribution of flow only—not actual volume of flow. 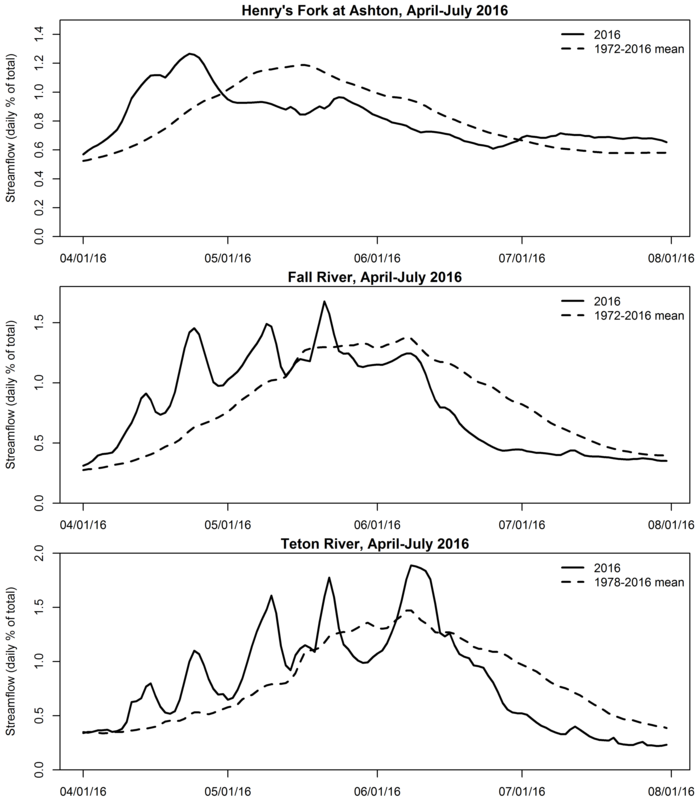 The graphs show daily percent of April-July flow, and it is obvious that a much greater fraction of the flow relative to average occurred during April and May, leaving a much lower fraction of flow in the river during June and July. 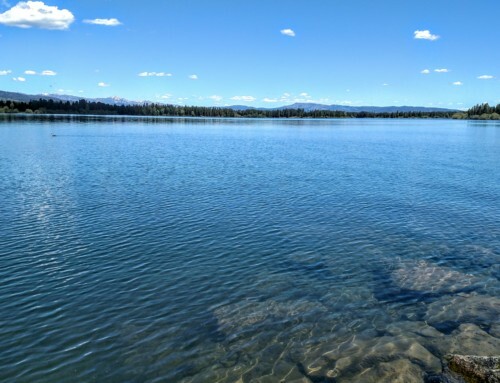 This necessitated early and high delivery of water from Island Park Reservoir to meet irrigation demand, resulting in higher-than-average outflow from through Harriman State Park from June 20 to August 3. 8. What will 2017 bring? Just 10 days ago, we were heading for a great water year in terms of SWE in the mountains. The upper Henry’s Fork, which had been lagging the rest of the Snake River basin in SWE, had reached 122% of median, and Fall River and Teton River subwatersheds were well over 130% of median. Weather forecasts called for a cool and wet pattern for the rest of March. Based on that information, it looked like we had a good chance of arriving at April 1 with well-above average snowpack, which the information in this blog shows will generally lead to later-than-average runoff. Unfortunately, the weather suddenly turned warm and dry, and substantial melt has already occurred at elevations below 7000 feet, which is much of the upper Henry’s Fork watershed. This illustrates why predictions of runoff volume and timing are both fairly poor based on conditions at the beginning of March. The best models we found to predict runoff timing based on March 1 information all had R2 values of less than 0.35. Those models aren’t much better than just using the long-term mean as a prediction for the upcoming spring. Models based on April 1 information are much better from the SWE standpoint but are still fairly weak with respect to temperature—R2 values for predicting runoff timing based on information in hand on April 1 range from 0.38 for the Teton River to 0.52 for Fall River. The best models rely on knowledge of April-June temperatures, which we won’t know until they happen. However, the latest long-term forecasts call for average temperatures over the April-June period here and above-average temperatures slightly to our southeast. At the rate we are currently losing SWE, we will end up somewhere around 100-120% of the 30-year median across the watershed on April 1. Thus, the best estimate I can provide right now is that runoff timing should be fairly close to average across the whole watershed—slightly early in the upper Henry’s Fork and slightly later in the Fall and Teton River watersheds. Total streamflow will be below average in the upper Henry’s Fork and slightly above average in the other two subwatersheds. Conditions will most likely be better than last year but not nearly as good as they could have been had the robust early-March snowpack stuck around until April 1. Check back during the first week of April for more precise predictions based on early-April data. 9. What will future decades bring? Patterns of precipitation and temperature in the Henry’s Fork watershed over the past 40 years are consistent with global climate models and data. For three decades, climate scientists have predicted warmer temperatures for the northwestern U.S., with more variable precipitation. The data we have presented here corroborate those predictions. Climate models forecast continued warming, and if the trends we document here continue, we will experience warmer springtime temperatures and earlier runoff. Big water years that bring abundant snow and rain will counteract the effect of temperature, but years like 2015 and 2016 are more likely to occur in the future if the pattern of warmer temperatures and more variable precipitation continue. These two years provide examples of the worst that can happen—very warm temperatures and very low snowpack—and these types of years can occur within in a year or two of other years with well above average snowpack and cooler temperatures. If nothing else, we will continue to experience more extreme conditions and much more year-to-year variability than back in the 1950s and 1960s. 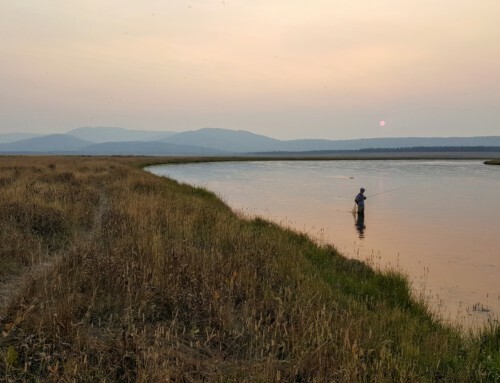 None of us working, living, and fishing here on the river day in and day out can control the trajectory of climate—regardless of whether one believes climate science or not. Our only option is to learn as much as we can about how climate affects our rivers and use that information to adapt. The huge amount of data I analyzed for this blog and look at on a daily basis provides strong scientific evidence that temperature and streamflow patterns are changing, and the peer-reviewed scientific literature on stream ecology—including our own work—quantitatively links these changes to changes in trout ecology, insect emergence, and stream habitat. As much as we might like to believe and desire that climate, ecological systems, and socioeconomic systems are static, they are not. To think otherwise is denial of facts. Decades ago, I used to fish the salmonfly hatch on Fall River on my birthday—June 21. If I want to fish salmonflies on Fall River now, I need to plan on getting out there around June 10. If I don’t, I miss the hatch. My desire to have the same birthday fishing experience that I did 30 or 40 years ago doesn’t change the reality of springtime temperatures that are 4-6 degrees warmer than they were when I first fished the Henry’s Fork in 1977. Despite the threats that a warmer and more variable climate pose to our fisheries and angling experience—to say nothing of the compounding effects of increased demands for water throughout the Snake River basin—our thorough understanding of these threats has given us some unprecedented opportunities to pursue large-scale changes that will sustain our fisheries into future decades. One example is reconstruction of the outlet works at Island Park Dam to allow selective withdrawal of water from the layer of the reservoir that will provide optimal water quality downstream. Another example is a basin-wide market for water that has opened up in the last 18 months as a result of a legal settlement to a decade-long water-rights court case. This market offers the first opportunity ever for exchanging water among different users throughout the basin in a manner that could keep more water in Island Park Reservoir during the summer, allow higher winter flows, and increase the flow of cool groundwater into the lower reaches of the Henry’s Fork during the summer. Make no mistake, these opportunities will be expensive—on the order of tens to hundreds of times HFF’s current budget—but they offer a once-in-a-lifetime opportunity to secure quality fisheries into the future. To get there, we all need to continue to educate ourselves and the larger angling and conservation community with accurate scientific, economic, and legal facts. Furthermore, we all need to work together to leverage the substantial resources we need to preserve our fisheries. Hatches and runoff may still happen earlier 30 years from now than they did 30 years ago, but the integrity of our aquatic ecosystems and fishing experiences will remain intact.